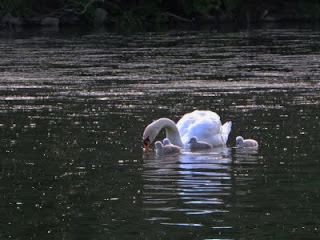 There are now only three baby swans!! There are only 3 surviving cygnets. I saw that; I also saw a giant snapping turtle recently. Oh noes. Also, over the last two days, I noticed all of them up and moved (I hope) to somewhere else on the lake[?]. It is getting mucky on the outfall as we approach algae bloom season and hope they just decided to move. I hope nothing bad happened. Sorry for the delayed comment moderation as well. I took a bit of a break, but just received new notices so have a lot of info to share. Plus I have video of our weed harvester in action on the lake. Have you seen it before?